Camp Meigs (2) (1862-1865) - A U.S. Civil War Union Training Camp established in 1862 near Readville, Suffolk County, Massachusetts. 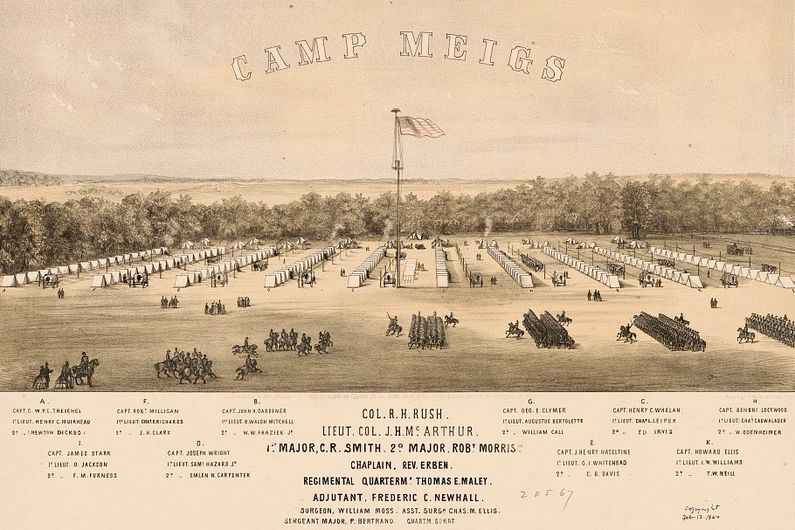 Named Camp Meigs after Quartermaster General Montgomery C. Meigs, (Cullum 846). Closed in 1865. Established in 1862 as a training camp for Massachusetts Volunteer Militia (MVM) troops enlisting for duty in the Union Army during the U.S. Civil War. Readville camps processed and trained at least 29,000 of the 114,000 men who served in the MVM units raised by the Commonwealth and processed at least 54 units. The Camp encompassed 139 acres and included barracks, stables, officers' quarters, kitchens. Massachusetts Black regiments trained at Camp Meigs beginning in 1863. 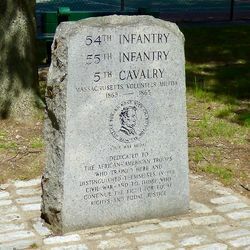 Those units included the 54th Infantry MVM, the 55th Infantry MVM, and the 5th Cavalry MVM. In 1864 Camp Meigs became the site of a thousand-bed US Army General Hospital, caring for the injured and sick of the Massachusetts Volunteer units near their place of enlistment. The hospital came to have some 71-buildings including wards, quarters, kitchens, support buildings, storehouses, etc. The staff treated more than 4,000 troops for campaign-related wounds or disease. The hospital was phased out at the end of the war with last wards being auctioned off in January 1866. At the end of the war, Camp Meigs also became a demobilization center, mustering out and discharging many Massachusetts units returning from the war. Closed in 1865. Camp Meigs Black Regiment Memorial. Now Camp Meigs Memorial Park with many markers, reader boards and other memorials celebrating the contrbutions. Location: Readville, Suffolk County, Massachusetts. Roberts, Robert B., Encyclopedia of Historic Forts: The Military, Pioneer, and Trading Posts of the United States, Macmillan, New York, 1988, 10th printing, ISBN 0-02-926880-X, page 405. This page was last modified 20:49, 7 January 2019 by John Stanton.